Whether you're on a day trip or a three week expedition, your clothes need to perform. Sun protective, quick drying, cooling technology and even bug resistant clothing will keep you protected and comfortable wherever you roam. Our protective clothing includes shirts, pants, hats, and other accessories to keep you covered and protected wherever your adventures take you. Fresh Produce has been inspiring ladies to express personal style for nearly three decades. The brand's foundation is a collection of staple pieces—in women's and plus sizes—fashioned from easy-care fabrics. They are dedicated to creating feel-good clothes women want to wear every day. Live Life, Enjoy Color. Toad&Co makes sustainable outdoor clothing you can wear from the trail to the tavern and everywhere in between. Drift off course with Fish Hippe – one of our newest lines at Island Outfitters – soft cotton tees in coastal colors. Here at Island Outfitters we care about our customers and only select apparel with the highest quality and comfort. For the best in comfort and support go no further than Chaco or Olukai. Both are made to go from the water to out on the town. KAVU rope/sling bags, are built for your fun and freewheeling lifestyle. See what’s out there with Costa Sunglasses – the area only Premium Costa Dealer with all the latest styles. Make sure you furry friends are covered with Ruffwear for Dogs on the Go. We carry only REAL sea glass, worn by the waves naturally. Love the rare cobalt and aqua colors! 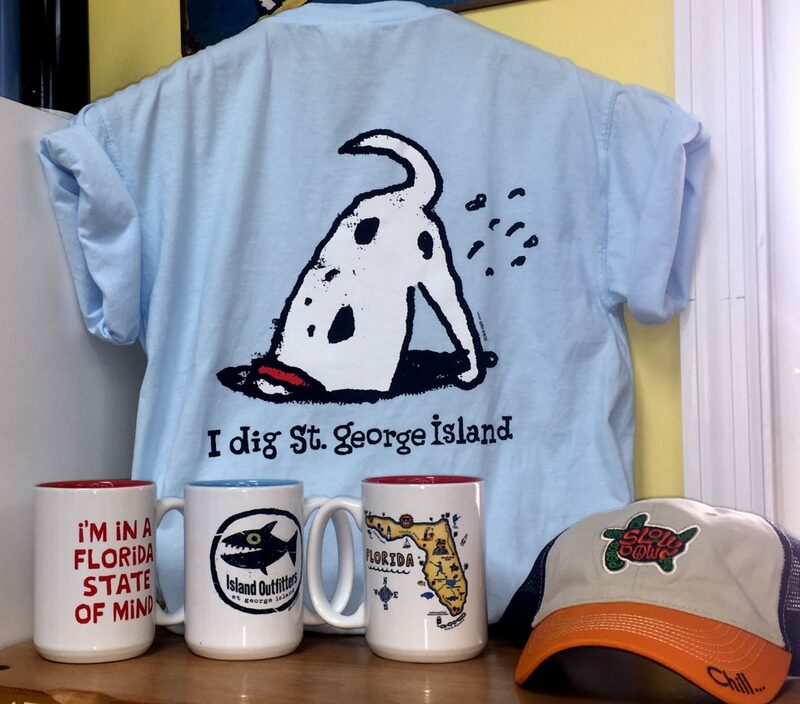 St. George Island Sand Jewelry - The Original Beach Sand Jewelry Co.™ DUNE. Dune Jewelry is a keepsake, collectible jewelry line made with beach sand from St. George Island for your most cherished coastal memories. Our patent pending “Sand & Silver” technique unites sand from your favorite beach with sterling silver to create pieces of jewelry that actually hold a memory…special vacations, exotic adventures, proposals, honeymoons, childhood beach houses, first kisses, lazy days at the beach with your favorite friends. All new earrings, necklaces and bracelets from around the world. You can find these treasures and more only at Island Outfitters!